Disclaimer to my parents and to my kids. I assume you really are not interested or care to hear about your daughter/mother’s dating adventures. Although, I realize it’s kind of like a train wreck…and we all know we try to look away, but just can’t…but, don’t say I didn’t warn you. I’m single. I’m forty-something and I’m single. I’m a mother of four, I am forty-something and I am single. I am a mother of a toddler who is one of four children, I am forty-something and I am single. I work two jobs, I am a mother of a toddler who is one of four children, I am forty-something and I am single. Wanna go on a date? Now, the funny thing is I have not once sat home on a Saturday night pining for a date. When I am home it is because that’s where I choose to be…and I know a date is only a phone call away. Or an online message. However, there’s not really a large pool of folks who would gladly take on me and all I have that goes with me…and the limitations that go with being with me. They exist, but are far and few between. There is, however, a large pool of guys that would enjoy a night out…or in…and then go back to life as usual. Thanks anyway. Been there, done that. Check my snap chats and text messages. Those invites are aplenty…or at least until I just wrote that. I imagine that might slow my text alerts at 10:30pm. Back to the small pool that would take on the whole package, I then need to do my own weeding out which generally leaves me with a nearly empty swimming hole. How do I weed them out? Well that’s basically finding everything wrong with them that might inhibit a long term relationship, or even a short term one. Red flags we call them. I feel like a fricking referee in my head throwing all the flags around while on a date, talking to or emailing these poor souls! Nobody stands a chance. That’s not to say my red flag throwing is not spot on in most cases. Let’s explore that. I was with my youngest’s father for about 7 years I guess…but in the middle of that time we had split up for a year and a half. I found myself truly single for the first time in my adult life and about to date. I was a thirty-something at the time…three children. Looking around me and knowing there was no freaking way I was interested in anyone I knew…my online dating adventures began (insert dramatic sigh). POF, Match.com, eharmony…even christiansingles. I tried them all and probably still have active profiles on the bulk of them. I was officially dubbed “One-Date-Wendy” by my peers. For various reasons, that’s as far as it would go. I actually got to a second and even a third date with a few…but never a love connection. Why? A lot had to do with my well conditioned flag throwing arm, but mostly to do with my ridiculous adventures. You know, the one with photos from a decade and 75 lbs ago. The one who had three martinis to my one glass of wine and got very upset when I checked my phone…accusing it to be my “escape” to get away from him. Why yes, sir…it was. Buh-bye! “Mr. Disney” (yes, I nicknamed them all) who I remain friends with, made it to date two. By second date, I mean making out in the backseat of a compact car in a parking lot at the beach… That mighta worked in high school, buddy. In his defense, and mine, he lived up to his nickname and moved to Orlando, got a job at Disney and married his princess in front of the castle! Not all my “one dates” were from online, either. “Construction Guy” smiled and waved to me everyday on my way to work…finally flagging me down to ask me if I was single. Yes! I was! Super hot, hard hat wearing, tan, muscular armed engineer wanted to meet me for coffee. Day-um. Too bad I learned during coffee that his wife was not aware of their up and coming divorce!! I have more stories than I know what to do with. So, what I have learned? Chill with the flag throwing. Mr. Right Now can teach you many lessons, about life and yourself, on the way to Mr. Right. And who knows…he might even drop the “Now”. Eating is really one of your indoor sports. You play three times a day, and it’s well worth while to make the game as pleasant as possible. 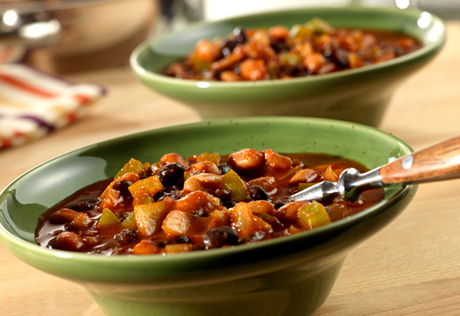 I was just asked the recipe for my vegetarian chili…you know, the one where my meat eaters hear the word “vegetarian” and turn up there noses. Until they try it! If you are a vegetarian, this is a great recipe! If you are a carnivore, this is a great recipe!! The portabellas give this chili a meatiness and you don’t even miss the beef. And that even goes for my fungus hating audience! A little heat and a nice depth of flavor in this one. Enjoy! In a large, heavy pot, heat the oil over medium-high heat. Add the onions, bell peppers, garlic, and serrano peppers, and cook, stirring, until soft, about 3 minutes. Add the zucchini, corn, and mushrooms, and cook, stirring, until soft and the vegetables give off their liquid and start to brown around the edges, about 6 minutes. Add the chili powder, cumin, salt and cayenne, and cook, stirring, until fragrant, about 30 seconds. Add the diced tomatoes and stir well. Add the beans, tomato sauce and stock, stir well, and bring to a boil. Reduce the heat to medium-low and simmer, stirring occasionally, for about 20 minutes. To serve ladle the chili into the bowls. Top each serving with a dollop of sour cream and spoonful of avocado. Sprinkle with chees and green onions and serve with warmed tortilla chips. Comfort food at it’s finest!! The changes I made were that I substituted the saffron with dried basil and I used half and half instead of heavy cream….and I doubled it. I also used american cheese on the sandwich as it’s what I had on hand…and added a slice of genoa salami. No need to make as croutons…although you can and it’s a neat idea, but it just gets soggy and it’s an extra step. Here’s a picture we took of ours tonight! Enjoy! The 11th of each month leaves me listening to this song. Not one has gone by yet that I’ve missed. This 11th marks 17 months since Michael passed away. We spent our early times together in the establishment I worked in…mainly a Karaoke bar…listening to the DJ’s serenading us with this song we requested. It spoke to us and we loved to hear it, dance to it…and sometimes Mike would sing it….and I use “sing” loosely!!! It evolved into a song that when on the job site, Michael would hear this song (as he often would with his classic radio stations blaring!) and immediately call me. When I would answer, there was no “hello”…just music in the background until the song ended. And if I couldn’t answer, I would get the voicemail that played the whole song to me. I found this rendition tonight. I thought it was beautiful. Not only because this song is so special to me, but because I get to hear this song I love in a new way. My love and hurt is still there…but different now. This composition of Leather and Lace is a perfect expression of that. Oven Fried Buttermilk Chicken…a kid pleaser for sure!! I got this recipe from Chow.com and have made it several times. Super easy and delicious if you love fried chicken! Paired with corn on the cob and cranberry sauce…everyone was happy! The buttermilk soak makes the chicken so tender and juicy. 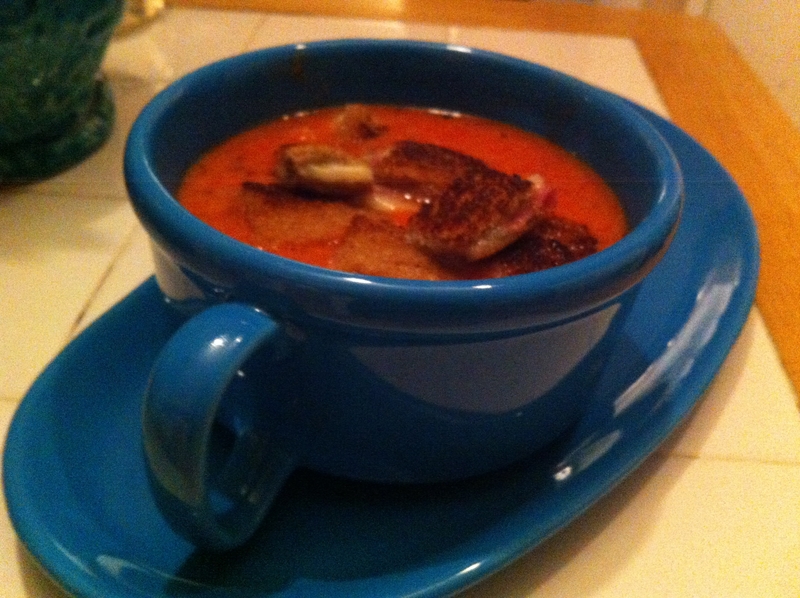 I was actually able to soak this Friday night and cooked it according to the recipe the next day. I packaged it when cooled in an airtight container in the fridge. Tonight when I got home (Monday night) I heated it in the oven preheated to 375 for about 25 minutes while the corn was steaming. Dinner was on the table in 1/2 an hour…Perfect! Ideal for a picnic, this crispy cornflake-coated chicken needs no utensils to be enjoyed. Marinating it overnight in rich buttermilk and a heaping dose of hot sauce makes for moist, flavorful, tender chicken with a kick of spice. 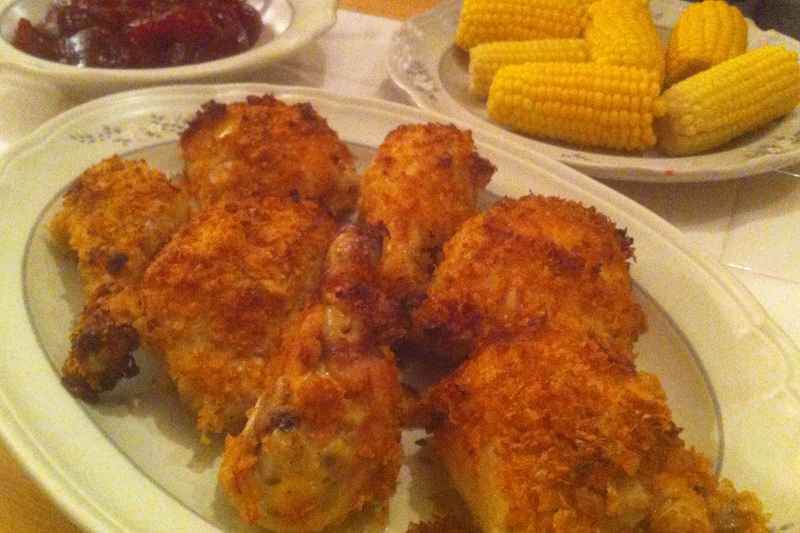 What to buy: Kellogg’s Corn Flake Crumbs are the perfect size for coating chicken. If you can’t find them, you can use 5 cups of cornflake cereal and process it in the food processor until finely ground, or place it in a plastic bag and crush the flakes with a rolling pin. Game plan: If you cook the chicken just before leaving on your picnic, transport it warm, uncovered, in a basket lined with paper towels and foil. If you make it a day ahead, let it cool, then refrigerate it overnight. Pack the cold chicken in a plastic container lined with parchment paper. The chicken needs to marinate overnight, so start this recipe a day in advance. Combine the buttermilk, garlic, hot sauce, measured salt and pepper, paprika, and cayenne in a large bowl and stir until evenly combined. Pat the chicken dry with paper towels and transfer it to a 13-by-9-inch baking dish. Pour the buttermilk mixture over the chicken, cover, and refrigerate 12 hours, turning once. Heat the oven to 400°F and arrange a rack in the middle. Fit a wire rack inside a baking sheet and set it aside. Place the Corn Flake Crumbs in a shallow dish and season generously with salt and pepper. Remove a piece of chicken from the buttermilk marinade, letting the excess drip off, and place it in the Corn Flake Crumbs, turning to coat completely and pressing the crumbs onto the chicken to adhere. Set the chicken aside on a cutting board and repeat with the remaining pieces. Drizzle the melted butter evenly over the chicken pieces and transfer them to the rack on the prepared baking sheet. Bake until golden and crispy and a thermometer inserted into the chicken (but not touching the bone) registers 165°F, about 35 minutes. Beverage pairing: Agrapart & Fils Blanc de Blancs Grand Cru, France. Champagne is a great match for fried chicken, oven or otherwise, for three reasons. One, the bubbles just seem to go wonderfully with the texture of the batter. Two, the lemony flavor complements the chicken. And three, there’s the pleasure of the high-low: Champagne for chicken, not caviar. Yes, busy Moms need a plan. As a single Mom who works two jobs and has three children at home…I definitely need a lot of plans. First and foremost, I need a menu planned for the week and a grocery list built off of the menu. My menu is generally compiled with three things in mind; what’s already in my pantry, what’s on sale, and what the kids are begging for as a dinner idea. Those three things in addition to keeping it quasi healthy and to continue to introduce different vegetables to the kids. It usually takes me hours to make the list and execute the shopping. I am hoping by posting my menu ideas here it will help me with my planning down the road and minimize the time commitment for me in the future!!! I will add recipes throughout the week for this menu. Tonight’s meal? 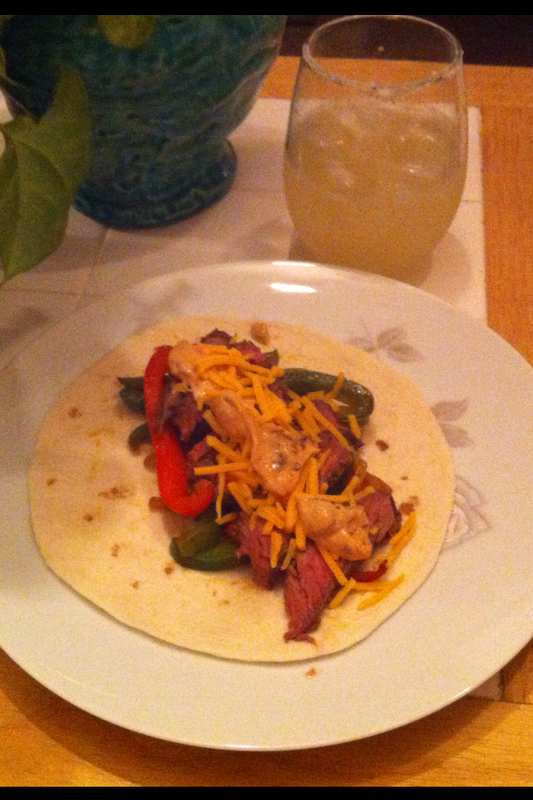 The Beef Fajitas. I had a New York Sirloin in the freezer that was on sale a week or two ago…it was soooo tender! The kids gobbled this up, although they opted for regular sour cream as opposed to my spicy lightened up version. I had a mini margarita to accompany my little Mexican dish. Every one was happy! This needs to be started earlier in the day or the night before to properly marinate the beef. Whisk together all ingredients and put into resealable bag. Add beef and marinate in the refrigerator for at least 4 hours. 2-3 lbs beef. I used NY Sirloin and it was Fab. Take the marinated beef out of the fridge and let come to room temperature…about 20-30 minutes. Broil the marinated steak in the oven for about 7 minutes per side or until desired temperature. Transfer to cutting board and after letting rest for 5 minutes, slice the steak into very thin strips. While the steak is broiling, heat the olive oil in large saute pan. Add onions and peppers and stir, coating them with the olive oil. Add the chili powder, cayenne, salt and pepper and continue to stir well over medium high heat until onions are nicely browned and peppers are tender (about 10 minutes). Warm the tortillas per package directions. Pile the veggies and beef on a platter and let everyone assemble the fajitas with the cheese and chipotle sauce and devour them! !